A short while ago a huge Lilac tree shadowing my greenhouse was seriously cut back. There's now lots more light and warmth in there. 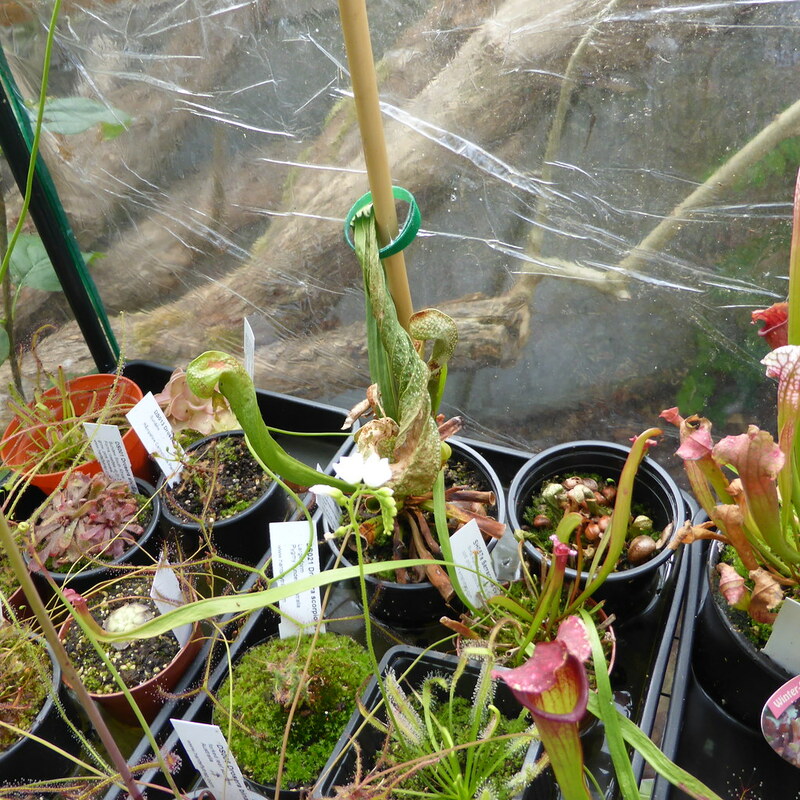 The sarracenia in the top right of the picture doesn't look to good either with the tips of the pitchers very brown. I can't say what exactly happened in this case, but this is not true (at least not in the sense that they would need cooler roots than other plants, as of course very few plants like hot roots), it's a myth spread by people with little experience growing plants in general. My Darlingtonia are in black pots and have been standing in full sun, including the drought and current heatwave (37 C locally), no problems at all - save for a slug that had a nibble at the base of a nice green leaf... not that the plant cares, in fact said leaf is still standing. I must say that what I am lead to belive about the root being cool. Have had keeping Dalingtona going a struggle over the years I am now going to try clay pots as these may keep the roots cooler to see if this works. I know lots of growers keep them in black plastic pots no problems. I use ikea white pots with holes drilled in, they seem to be ok, and are cheap. it's a myth spread by people with little experience growing plants in general. No. Those are last year's leaves. being very new to this I didn't know whether or not to cut them off. This year's leaves are about twice the height and look very healthy. It's a cv juthatip soper. Those are last year's leaves. It's S.cv juthatip soper. This year's leaves look great. Twice the size and beautifully coloured. Being new at this I didn't know whether or not to cut the old leaves off. So I played safe and left them on. I believe many in the US have trouble growing darlingtonia because their climate is nothing like it is in N California or Oregon. There shouldn't be similar problems in this country. I grow both outdoors and in the g/h and have had a very good year. The outdoor pitchers in particular have caught so many flies they're going brown and getting very smelly. Try potting up into a bigger pot (any colour!). Darlingtonia have quite a wandering root system. Give it room and they thrive. Small plants in tiny pots is not the way to successfully grown these. They're quite happy outside too.